Is the Paleo Diet Nonsense? According to most of the media, the Paleo diet is nonsense. See the latest example by clicking right here. My Mom sent me that above article and wanted to know what I think…. I agree with most of the points they are making, and so will most Paleo dieters. If you google “Paleo Diet” you’ll see long lists of foods you CAN’T eat, and all these strict guidelines. You’ll also see plates full of t-bones and bacon. Then, when you dig a little deeper, you’ll find that the most notable leaders in this ancestral health movement (such as Chris Kresser, Mark Sisson, and Robb Wolf) will say there is no “one-size-fits-all” approach to the Paleo diet, and white potatoes, for instance, are more than okay for anyone with healthy blood sugar regulation. Most Paleo advocates focus on eating as many vegetables as we can; veggies first, meat second. Oh, and note to all: veggies are carbs. I follow the Perfect Health Diet which is a variation of the Paleo Diet, also based on history and science. This diet focuses on maximizing nutrients, and minimizing toxins; preventing disease. Most of our ancestors thrived on a paleolithic diet which included tubers and white rice. So, I am not “low-carb”, and I think many Paleo dieters are the same way. Depending what your goals are – weight loss, fighting disease, healing from autoimmunity, or overall good health – you will not eat the same Paleo diet as another. In fact, one’s version of the Paleo diet may change several times in their own life, in order to suit their current needs (like when I HAVE switched to low carb, for a brief period, to stimulate weight loss). 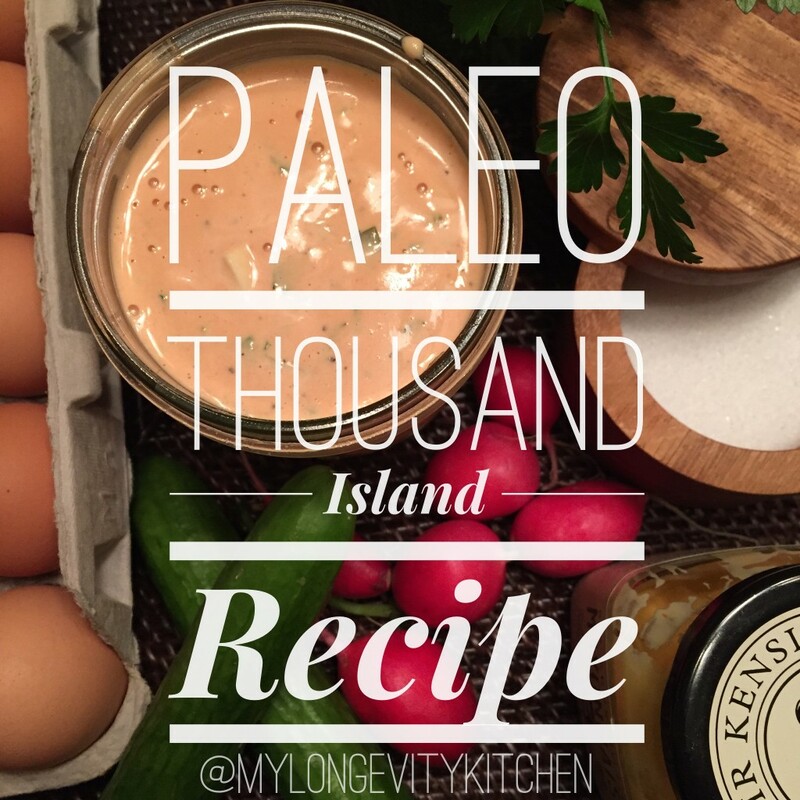 The Media should look through a wider lense, and they will see there is so much more to Paleo than at first glance. The diet they are referring to is NOT the Paleo Diet that most of us believe in, and practice. Besides, Paleo is much more than a diet. 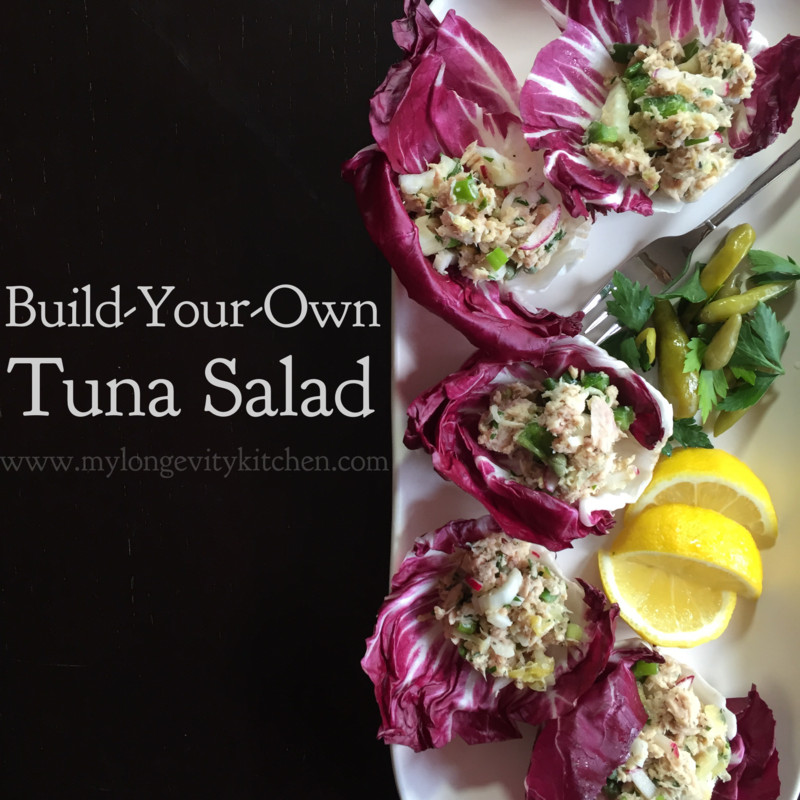 BUILD YOUR OWN TUNA SALAD! 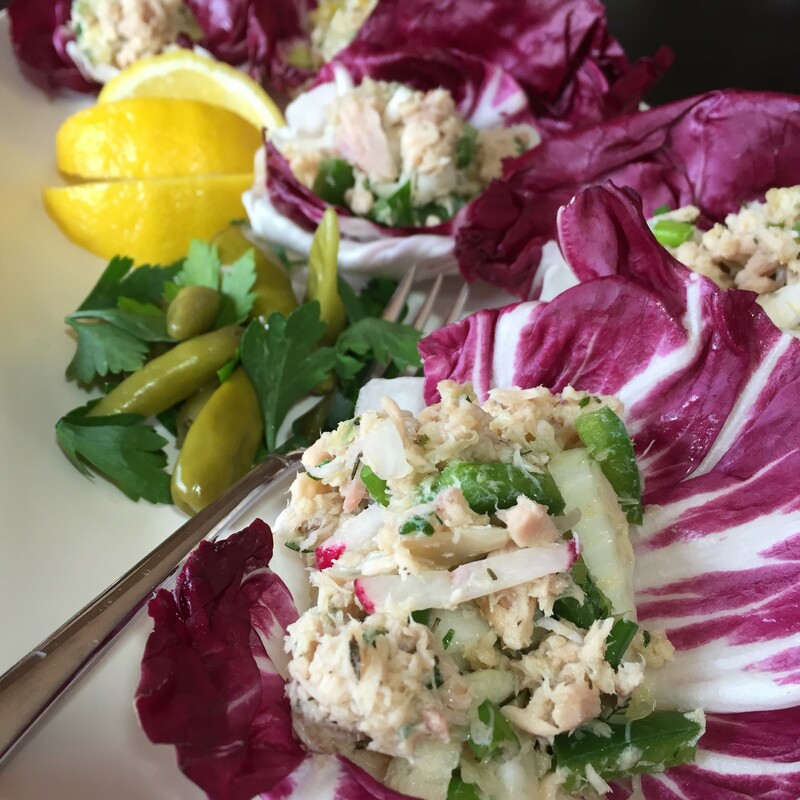 Most people think of tuna salad like potato salad and cole slaw…it’s always creamy. That is not true! 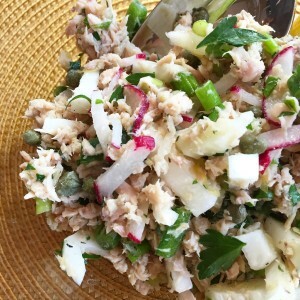 Many ethnicities use these foods to make bright and refreshing salads just like the tuna salad I am introducing here. 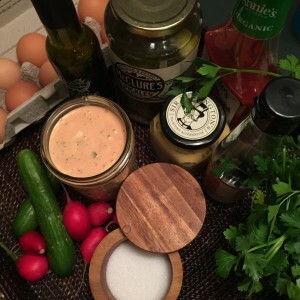 I decided to make this recipe “build-your-own” because there are so many different ways you can go! It’s such an awesome recipe to make when you are out of ingredients, and even out of time! I bring this over to friend’s houses for a quick party appetizer, and people always love it. Grab whatever you’ve got, and use my recipe template to build your own delicious salad. …………………………………. We should really take a minute and talk about how many different canned tunas there are. Too many! Well most of them are pretty crappy. They are overcooked, packaged with extra liquid, and even artificial flavors. Some tuna fish are much larger than other tuna and will have a higher mercury content. For many of these reasons above, I have switched over to Wild Planet Tuna. It’s cooked once, packed in it’s own juices (no water or oil), and they fish for smaller fish! Their white anchovies and sardines are the best I have ever had too. My pantry is always stocked with those. There’s a brand new tuna in town! And it sounds like it is far superior than anything available to consumers before. It is by a brand called SAFE CATCH. 100% of the Safe Catch tuna is tested for mercury levels (with their finest tuna being 10 times less mercury than the FDA limit). The fish is packed raw, and they have tested 70 cooking methods to find the perfect result for the final product. WOW! Safe Catch found me on Instagram and is sending me some free sample. I am pumped! I will probably order right now anyways…sales just started online. So go ahead and get the safest tuna around! It’s between $3.50 and $4.50 a can. I think it’s time to build your own tuna salad! Using bright herbs, briney goodies, and crunchy veggies, we are really setting a higher standard for canned tuna salads here. This easy tuna salad template will have you rockin' out a refreshing tuna salad with whatever you have in your fridge and pantry! Perfect for lunch or appetizers. See recipe notes for tons of ideas! CHOOSE YOUR PICKLED BRINY GOODIES. 1-2 Tbsp Capers, or chop any of the following and use up to a 1/4 cup: Olives, Pickles, Pickled Peppers, Caper Berries. In a mixing bowl, mix together the Olive Oil, Garlic, Onions, and 1 Tbsp of your chosen acid, with a pinch of salt and pepper. Now, add the rest of the ingredients and mix well. Taste for extra acid, if you prefer. Eat right away, or refrigerate and enjoy in the next 3 days. See Notes for many different serving ideas. Serves 2 for lunch, 6 for an appetizer. Put a heaping scoop on top of mixed greens, and you instantly have an entrée salad. Wrap it in romaine lettuce leaves and eat it like a taco. This tuna salad is fantastic alongside a scoop of cottage cheese or an avocado. Serve small scoops inside raddichio or "cabbage bowls" with extra lemon wedges on the side. A good bowl of chili is like a warm hug in front of the fireplace…and a GREAT bowl of chili is homemade and packed with veggies!!! Chili can be so flexible. So forgiving. It can be fast or slow, meaty or vegan. It can be thick or stewy, spicy or mild. It can be a one pot meal, a crock pot meal, and it freezes perfectly for your convenience. I just HAD to make this recipe “Build-Your-Own”. 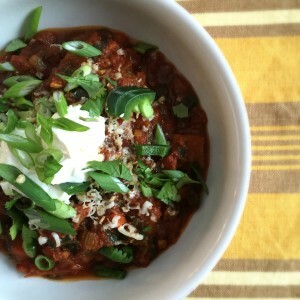 I have made this chili several times this winter, and it’s perfect every time. What kind of meat will you use? Chili enthusiasts will argue which cuts of meat are appropriate for chili. 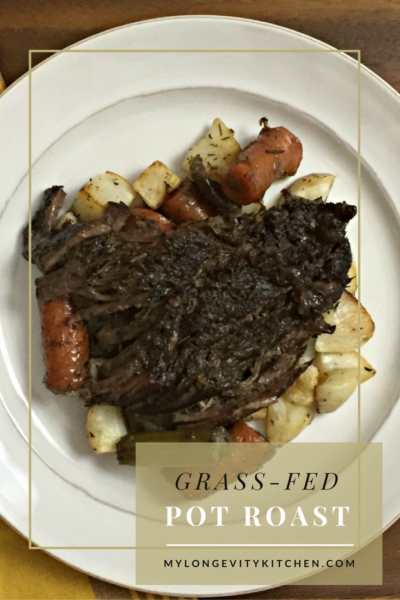 This is a great opportunity for you to cook with grass-fed beef or bison if you don’t already. The grass-fed ground beef can be found for as low as $3/lb, and the bison may be expensive, but in this veggified chili dish you will be stretching that $8/lb ground bison into 4-6 meals! Bison is more wild, and has even more longevity benefits than grass-fed beef. 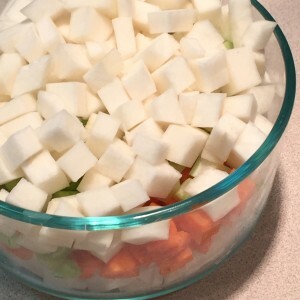 You may also use grass-fed beef stew meat diced small, chuck roast/pot roast diced small in 1/2 inch pieces. You can change it up entirely and go with some organic ground turkey or chicken…although I always suggest ruminant meats (grass grazing mammals: cows, lambs, bison, and goats) over poultry because they are more nutritious. “If we were to rank popular meats by their healthfulness, the order would be (1) fish and shellfish, (2) ruminants (beef, lamb, goat), and (3) birds (duck, chicken, turkey). In last place would be pork,” says Paul Jaminet from Perfect Health Diet. Now…WHY NO BEANS?? You might be thinking beans will add bulk for less buck; but that’s not the way I look at beans or legumes. I look at beans or legumes as a specialty item you should be cooking with only if you take the time to prepare them the old-fashioned way. Lastly, lets take a minute to recognize the star of this dish. The cooked tomatoes. Tomatoes, like other fruit, multiply in nutrients when you cook them. And the longer you cook them, the more nutrtients they will provide you! “Just 30 minutes of cooking can more than double their lycopene content,” and lycopene is the cancer-fighting, skin-enhancing compound that makes tomatoes red! Start cooking with organic tomato paste for the big win. This concentrated form of tomatoes has up to 10 times the lycopene of raw tomatoes! Thanks to Jo Robinson’s book “Eating on the Wild Side: The Missing Link to Optimal Health”, I am able to provide you with this important information. And skip the traditional cans because they are lined with all sorts of chemicals that tomatoes leach from (even if they are BPA free). 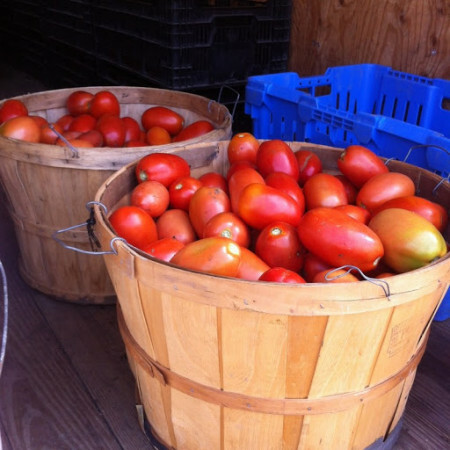 Go for glass jars or cartons of organic tomato products. Everything healthy is expensive if you buy it at regular price. I stock up on organic tomato products when they are on sale. You can often get glass jars around $3 a piece or less! Keep your eyes peeled and start stocking up (hello Costco). It is worth it people. Why use a cancer-fighting food if you are going to burden your body with loads of chemicals at the same time? I heart organic tomatoes. 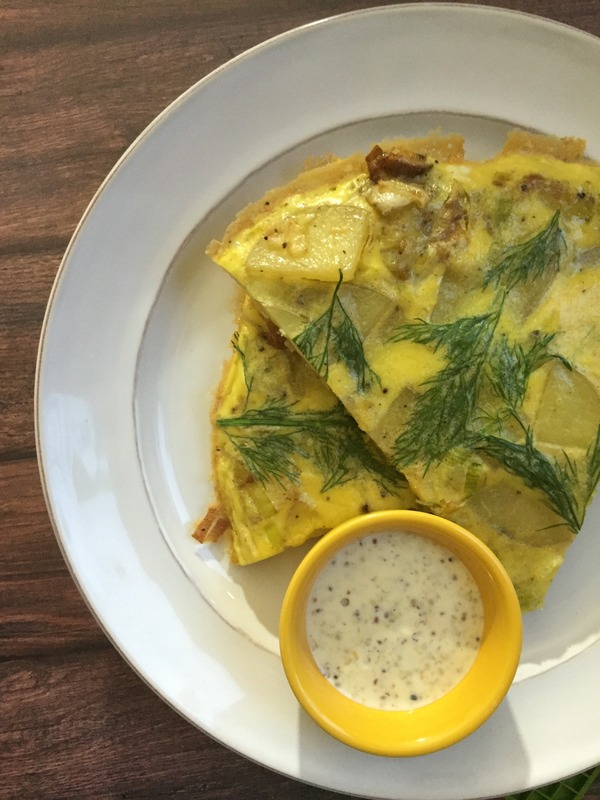 This is the type of dish you make on a Sunday when you might be interrupted a million times while cooking, you are feeling kinda lazy, and you want to make a dish worthy of family praise. Although very simple, this is the type of dish you have to prep the ingredients first! You cannot chop-as-you-go! This might sound a little troublesome, but it’s actually to your advantage in many ways. You can chop all the veggies up to a day in advance. Consider making a triple batch of chili seasoning in the recipe below, and use it later to give anything a spicy, smokey, warming flavor. Because this recipe is so chillaxed, you will need to get your salt and pepper arsenal ready and spice this chili with some intention! We will likely use different broths, different meats, or different tomatoes, different veggies; our salt is probably different types or grain sizes, and we may even be using different spices! For that reason, I cannot tell you how much salt you need; I can only guide you. OH! 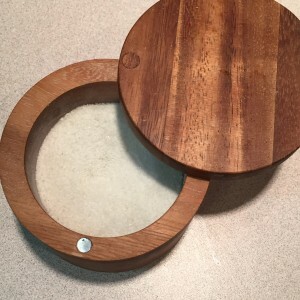 AND BUY YOURSELF A SALT CROCK ALREADY! Stop using the salt shaker from the table, and get real chef! You need to be picking up the salt with three fingers, and sprinkling it over your food like they do on TV. That’s how you get your food to taste good! Buy a salt crock, buy a bag of fine sea salt, and start practicing your salt showers today! P.S. It is almost impossible to get too much sodium in your diet when the food is homemade and you use sea salt. You'll find it hard to believe that 8 cups of veggies are jam packed into this no-bean chili. With the combination of grass-fed meats, slow cooked tomatoes, all those veggies, and homemade spice blends, you can really deliver the nutrition in this old-time family favorite. AND with this flexible recipe, you can customize it to your liking! Try it with different veggies, different meats, the slow-cooker method, and build-your-own spice blend. 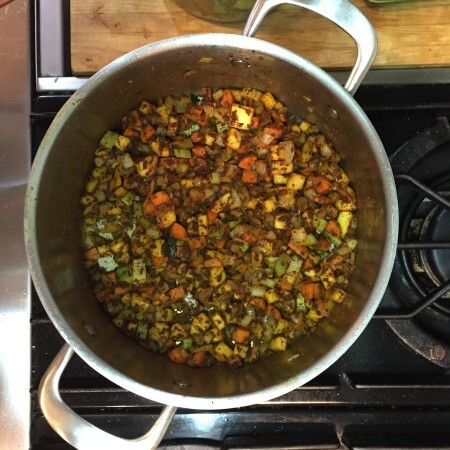 I've laid it all out for you in this DIY chili template. Prepare your chili seasoning blend, and prep all of your vegetables. If cooking with the old-fashioned stove-top method, continue to step 4. If using the crockpot/slow-cooker, throw all of the ingredients in and set timer for Low (8 hrs) or High, (5 hrs) depending on your schedule. Use the browning method if your cooker has one, and brown the meat first for more flavor. If you like a thicker chili, transfer to the stove top for 10 minutes at a light simmer, uncovered and most of the liquid will reduce. See notes for toppings! Heat a stock pot with 2 Tbsp of cooking fat. When it's hot, add your meat, and season with salt and pepper. You should hear the meat sizzle. When the meat is browned on all sides, remove it with a slotted spoon, and set aside. SEASON with salt and pepper and cook for 3 minutes, stirring occasionally. ADD GARLIC and LEAFY GREENS. Cook 1 minute, stirring occasionally. Add your MEAT and your longevity CHILI SEASONING, and stir. Can you smell the lovely spices? 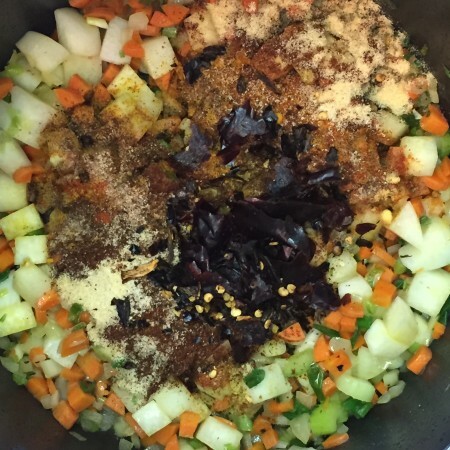 When the spice mixture aroma fills the air, about 1 or 2 minutes, you will add the TOMATOES and the bone BROTH/stock. Stir and bring everything to a simmer. Stir again and REDUCE HEAT to low, COVER PARTIALLY and set a timer for 30 minutes (partially covering it allows liquid to evaporate, and your chili to thicken). ADD your diced PEPPERS and 1 TBSP SALT, partially cover, and set timer for 15 more minutes. Uncover and STIR. If your chili is soupy, simmer for 10 more minutes uncovered. Taste for salt, and serve. See notes below for yummy toppings! 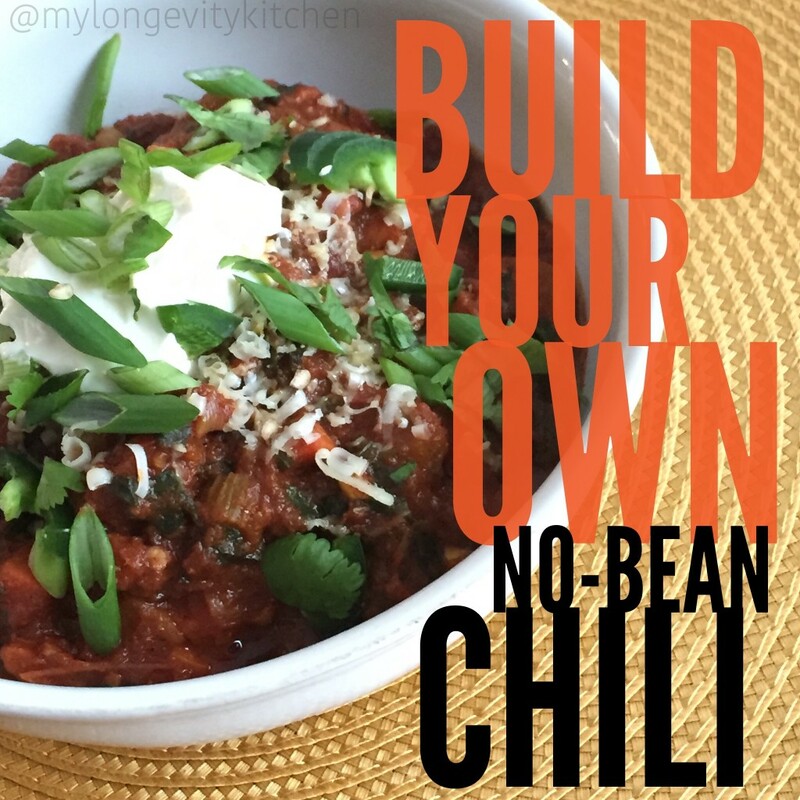 Suggested Chili Toppings include scallions, fresh jalapenos, cilantro, pickled peppers, organic sour cream or yogurt, diced avocado, and guacamole. 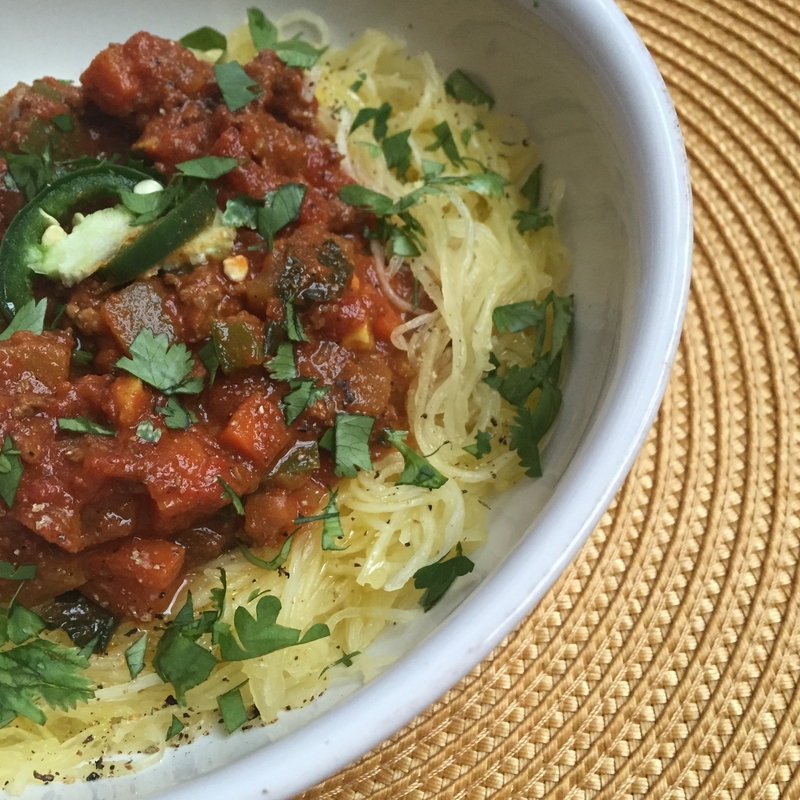 Stretch this dinner by serving over spaghetti squash or rice that is seasoned with olive oil, salt and pepper. 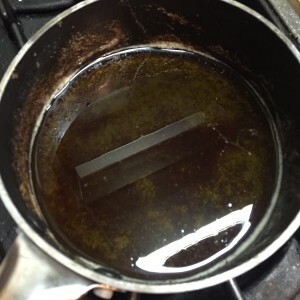 Braising is cooking something in liquid, at a low temp, usually after searing it first. Why do I love braising? It is easy; almost foolproof (unless you have too little liquid and burn your food), it always yields a flavorful, professional quality dish; and it is one of the greatest cooking methods for longevity. What makes it healthier than other cooking methods? Take a look at the warnings on www.cancer.gov, and see for yourself. Is this definitive? Can we be positively sure? No. It’s nearly impossible to test such a thing in controlled studies, especially on humans. But, gathering the information we have so far, HCAs and PAHs are dangerous to our DNA and might be making us especially vulnerable to cancers. What are HCAs and PAHs? They are chemicals created during the process of cooking meats at high temperatures, or over an open flame. I love the smells and flavors from grilling and roasting meats just like everyone else, but I am content now knowing that those cooking methods should be saved for specific occasions. Braising is a great technique to learn. You will find this cooking method works well on many of your favorite foods! 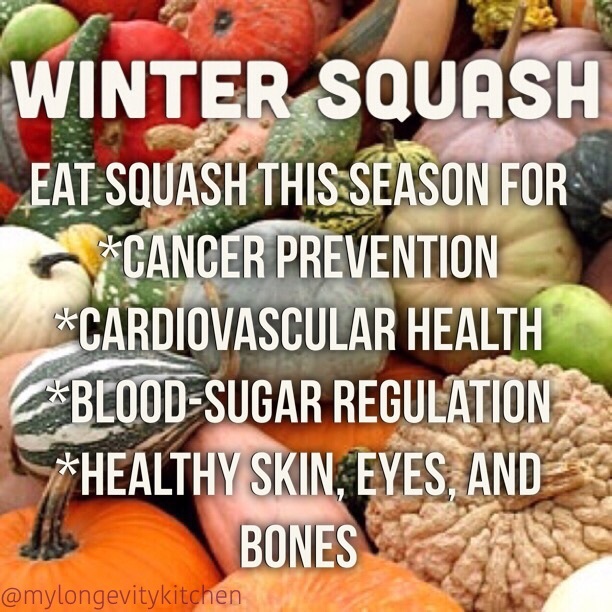 This works especially well with inexpensive cuts of meat, meat on the bone, and hearty vegetables. Speaking of inexpensive cuts of meat, the chuck roast, or pot roast, is an economical cut of beef. It comes from the shoulder of the cow, and has lots of connective tissue which makes it perfect for slow cooking. 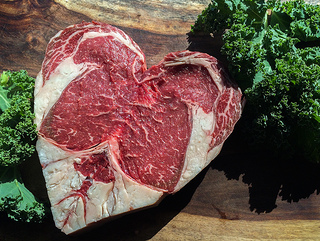 This is a great cut of meat to buy when switching over to grass-fed meats, trying to feed a family on high quality meats, and if you love tender, slow-cooked beef. If you find one with bone in, then go for it! Bones equal more flavor, and you can even reuse them to make stock after you scarf down this lovely meal. See the recipe notes for ideas how to stretch this meal, or even save hands-on cooking time using the slow cooker. This traditional braising method will give you the meatiest result though, so go for the big win! A traditional dish with tried and true cooking methods that delivers tender and flavorful results every time. 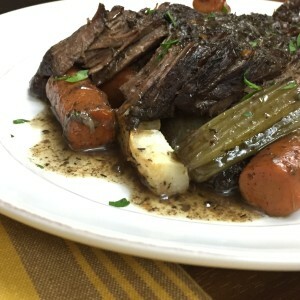 This flour-less pot roast recipe is made with grass-fed chuck roast, bone broth, and assorted winter vegetables. This warming, soulful dish will be a repeat in any house. This amount can serve 2 adults and 2 children, or 2-3 hungry adults. This makes great leftovers, so when it doubt, make more! Heat 1 Tablespoon ghee on high heat, and season the roast with plenty of salt and pepper on all sides. Once the pan is surely hot, place the roast in the pan using tongs. You should hear a loud sizzle. Time approximately 3-4 minutes on the first side to get a good sear. Sear both sides of the roast. You want dark brown color which takes about 3 minutes per side. Remove the roast from the pan and set it aside on a plate. Add 1 Tablespoon of fat, then the onion halves, flat-side-down, and the carrots. Brown the onions and the carrots. Now add the ½ cup of red wine, and using tongs, scrape the bottom of the pan with the onions...you want all the beefy goodness that is stuck on the bottom of the pan. Cook the wine for 2-3 minutes on a good simmer, so you reduce the amount of wine by half. Add the celery, turnips/potatoes, the rosemary, thyme, and some more sea salt and pepper. Give everything a good mix. Add 1.5 Cups of broth. Use more broth if needed to cover at least half of the steak. Cover the pot, and transfer to the oven for 2 hours. Your roast is ready when it is fork tender, and flaking nicely. You may serve it sliced or shredded, on top of the braised vegetables. I usually finish with a sprinkle of coarse sea salt. For a quick gluten-free gravy, while the roast is cooking, heat 2 Tbsp of butter/fat in a sauce pan. Then add 2 Tbsp of rice flour stirring for 2 minutes, careful not to burn. Now add 1 Cup of warm or room temperature broth, and whisk to incorporate. Bring to a simmer and continue stirring occasionally. The gravy will thicken as the heat rises. Season with salt, and herbs. If you are making the roast ahead of time, it is a great idea to use the broth left in the roasting pan to make this gravy as directed above. 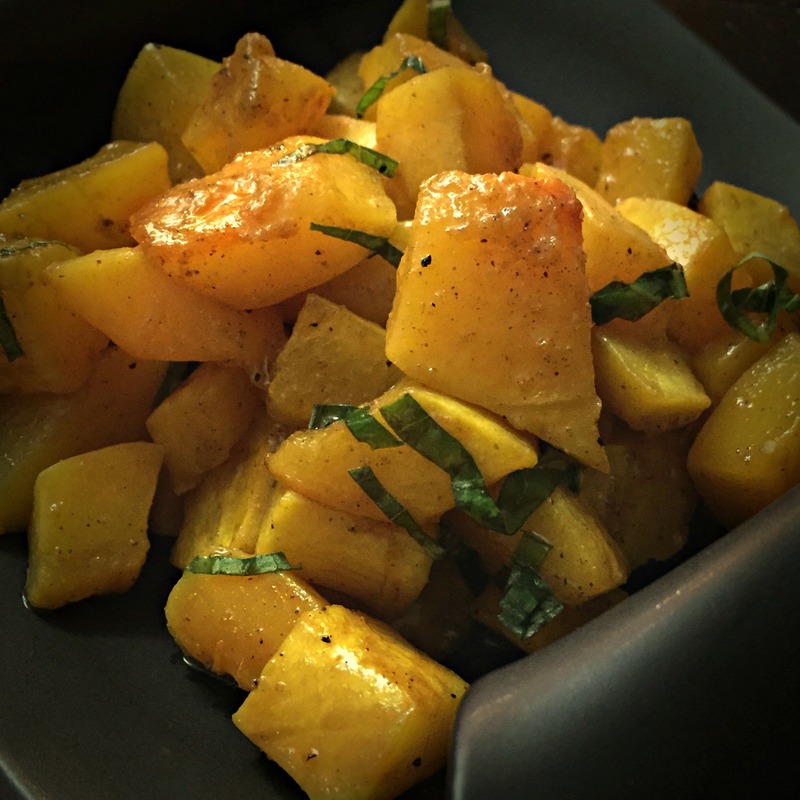 Stretch this meal by braising extra root veggies on the side. Peel and cube the veggies, rub with fat, season with salt pepper and dashes of rosemary and thyme, and place them in a pot/pan with enough broth to cover half of the veggies. 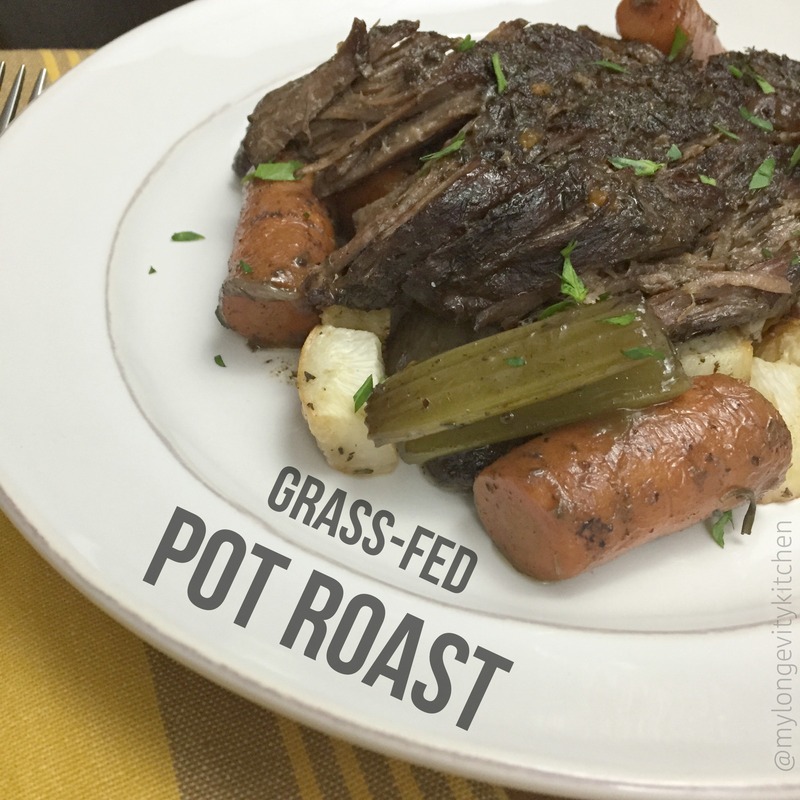 Cover and cook in the oven while making your pot roast, but check your veggies after 1 hour. Slow Cooker Method: This method can be great if you don't have time to do the full recipe. Season your meat with plenty of salt and pepper, place in the slow cooker, top with the veggies and spices, and pour 1/4 Cup Wine and 1.5 Cups Broth over the top of everything. Cook on low for 6-8 hours. Italians love their salads. There is always a salad at the family meal. A salad isn’t just a lettuce salad though. Tomato salads, broccoli salad, potato salad (no mayo over here), zucchini salad, yada yada, baccala salad. We often consider marinated and pickled veggies a salad when we’re in a pinch. 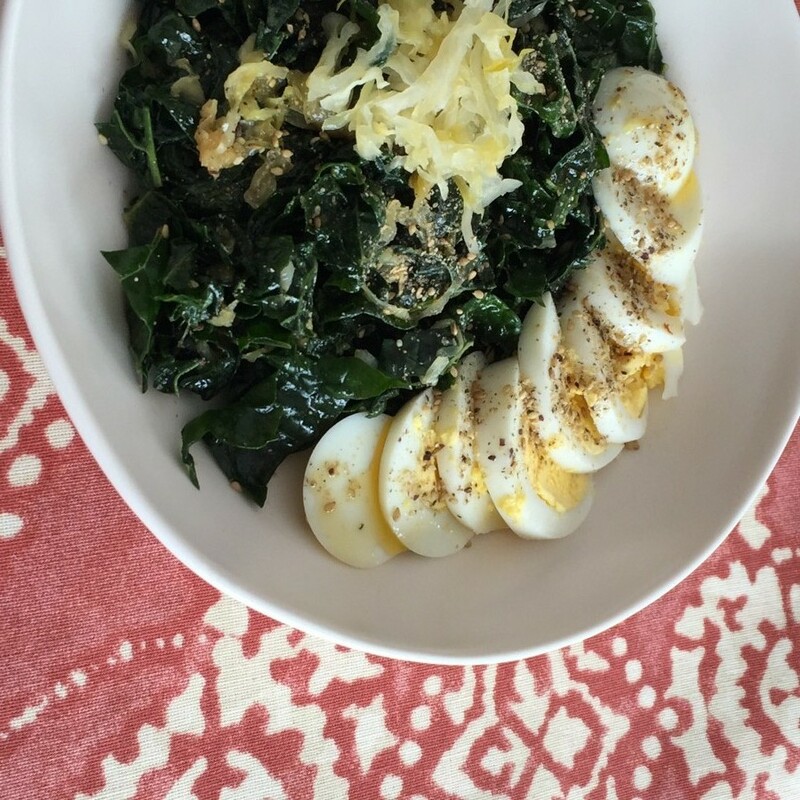 Here I have recreated a popular salad from my childhood. Broccoli salad was one of my Mom’s greatest hits if you ask me! I added cauliflower this time, along with the greens that surround the head. I also use scallions instead of red onions because that’s one of the only ways I can get onions past Eric. Feel free to add more or change up the onions if you’d like! This salad is sooooo easy, but a little laborious if you make a lot at once. I say that because you can only fit so much into the steamer basket and have to steam the veggies in batches. Other than that, it’s the easiest thing, and tastes so delicious! 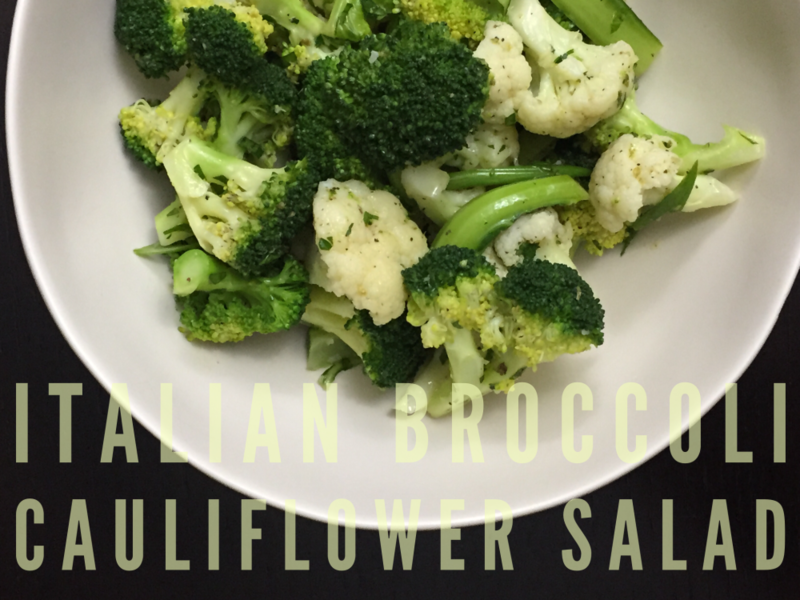 To save time, try this recipe with one head of broccoli or cauliflower. Just divide the dressing recipe, or make the whole batch of dressing and save some in a jar for salads during the week. The steaming and chilling process of the broccoli and cauliflower is great for meal prep. 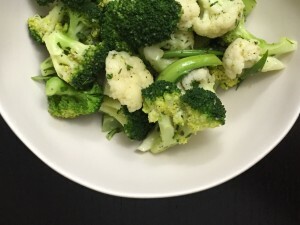 You can use this steamed broccoli and cauliflower in any dish to help save time during the week. You should always blanch or steam cauliflower for dip platters and party trays…no one likes a dry crumbly cauliflower; that’s why there’s always cauliflower on the tray! Steam it lightly and you’ll see them start flying off the tray. One trick for steaming cauliflower, and retaining its bright white color, is to add lemon juice or vinegar to the water instead of salt. The salt can make it slightly yellow. It is one of the only veggies that benefits from an acid in the water. Broccoli is one rapidly-aging beauty. What I mean by this is broccoli’s nutrients vanish into thin air every day that passes after harvest. It’s a darn shame I tell you! I wish everyone could grow broccoli in their yards year round, or have a farmer on speed dial. BUT, that’s not gonna happen. I’ll keep it simple. NEVER buy broccoli that is pre-cut, or unwrapped. It’s basically just fiber you’ll get with the pre-cut stuff. So if you love broccoli that much, you are in a massive hurry, and aren’t going for nutrients, then fine. Buy the bagged pre-cut stuff. But other than that, it literally retains almost zero nutrients. Just days after harvest the broccoli can lose 50-75% of it’s nutrients. Sad, I know. Look for broccoli that is dark green on top with tight florets. It should be wrapped in plastic, and have no yellow or pale florets. The stem should be bright green, and the bottom of the stem should be moist and flat, with no pocked holes. Call your grocery store and ask when the broccoli comes in. Buy it that day, and steam it right when you get home. This will preserve the nutrients. If you have a farm or farmers market you visit, call in advance if possible and ask about the day they harvest the broccoli. Also ask if they chill it immediately after harvest. This is key to obtaining the most nutritious broccoli with all the anti-cancer properties we love. Don’t worry as much about cauliflower. It doesn’t have as rapid of a respiration rate, and we can relax a little with that one. So call that grocer, buy that broccoli, and let’s get steamin’! This recipe works great with asparagus, potatoes, and green beans. In the summer you will love to try this with tomatoes, potatoes, and green beans all together. That will be great with some red onion. Tell me about your favorite combinations! 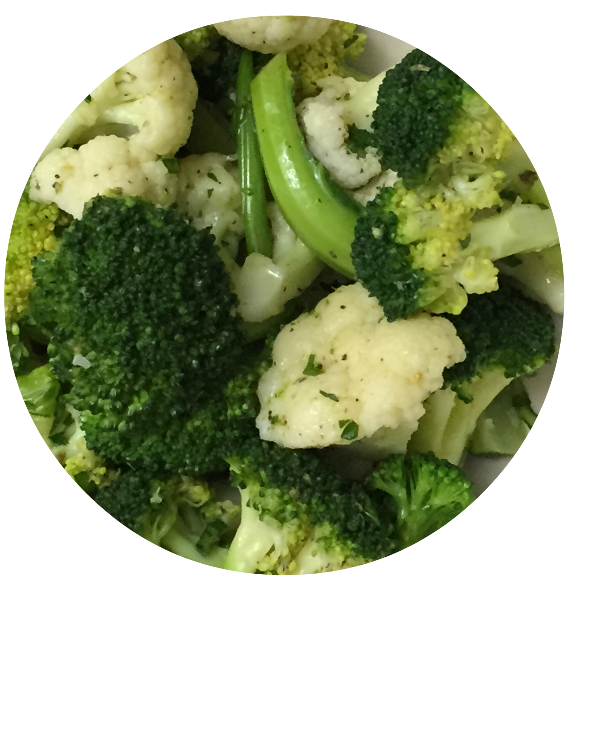 This simple salad of steamed broccoli and cauliflower is a classic flavor and side dish you will surely fall in love with. The dressing is made of lemon, red wine vinegar, fresh garlic and herbs, and the best extra virgin olive oil you can find. Serve this salad at room temperature throughout the week along side many of your favorite dishes. Prepare a steamer basket and pot of salted water for steaming. Get a large bowl filled with ice water to chill the veggies after steaming, and gather other tools such as a timer, a large slotted spoon, and a strainer. Clean and chop cauliflower into large florets, the size of about 2 bites. If the cauliflower greens are in good shape, cut the green stems/leaves into 2 inch long pieces, no wider than ½ inch. You may have to cut the stems lengthwise to make thinner pieces. Prepare the broccoli florets as well. Keeping them the same size if possible. Steam the Cauliflower florets for 3 minutes, in a single layer and in batches, using a timer. It helps to steam only pieces of the same size. Immediately remove the steamed cauliflower and transfer to the ice bath (do not steam more than 4 minutes or most nutrients will be lost). When the next batch is steaming, move the chilled cauliflower to the strainer you’ve set aside to use. Once all the cauliflower is steamed, you may start the cauli stems and greens. The stems might only take 2 minutes to steam, 3 minutes max. Repeat the steaming and chilling process with the broccoli. Now you will assemble the dressing. Start with a large bowl, big enough for all the veggies, and room to mix. Add the garlic, lemon juice, and red wine vinegar, scallions, herbs, and spices. Everything but the oil. If you would like the onion and garlic flavor then you may move on to the next step immediately. If you would like to calm the pungent flavors of the onion and garlic, let this mixture sit for 5 minutes or more. 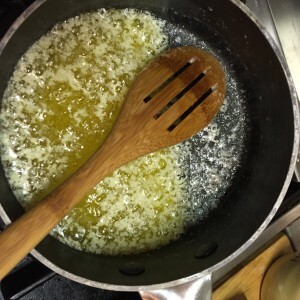 To finish the dressing, slowly stream in the oil while whisking constantly. This will create a nice thick dressing and make each bite of the salad more consistent in flavor. Your dressing will taste salty, but that is what we want! Once you add the veggies, that will no longer be the case. 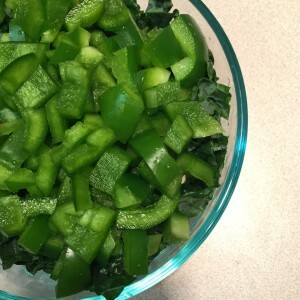 Mix in your veggies now, tossing numerous times to mix well. This salad keeps in the fridge for a week. If you don't have a steamer basket you may blanch in salted boiling water for 2-3 minutes, but the result will be much less nutritious. If you are eating the salad right away, this should be the proper seasoning. You may need more olive oil, lemon or salt if you had larger heads of broccoli or cauliflower. If you are eating this salad later, refrigerate, and remove 10 minutes prior to eating for the best flavor, and also to let the olive oil come to the right consistency. The veggies absorb the dressing the longer they sit, so you may feel the need to add more salt, oil, or lemon/vinegar, along the way. This salad is great to eat by itself, or you may add it to any salad greens with just a little extra oil and vinegar for a quick side salad! That name is a mouthful…a mouthful of meaty greatness! 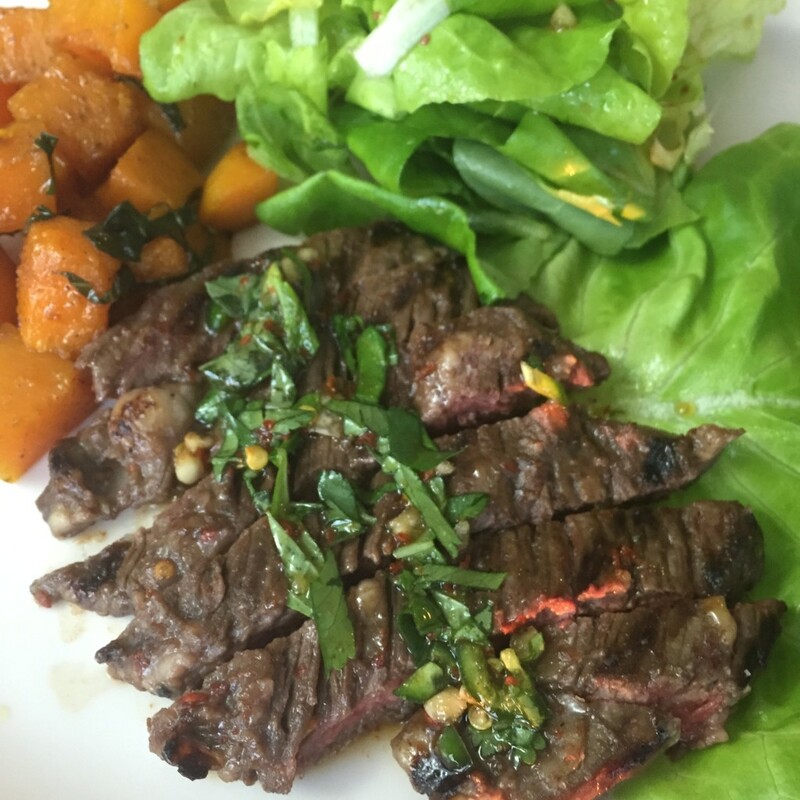 Skirt Steak is a great way to introduce grass-fed steaks into your budget. It’s much more economical and has a ton of beefy flavor. 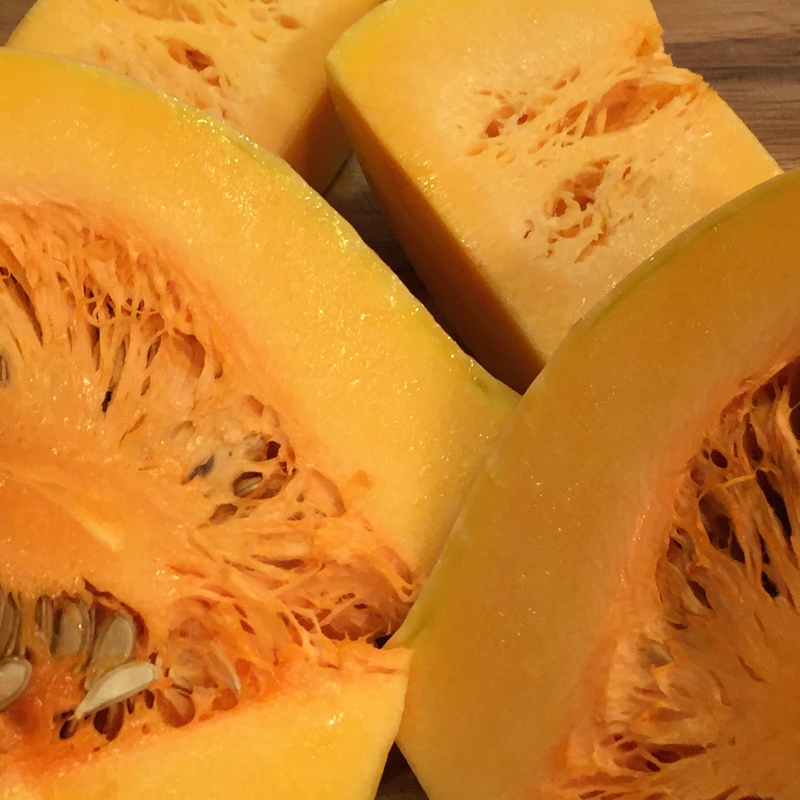 This cut can be tough or chewy if it is cut the wrong way, or even prepared the wrong way. And the beef from grass-fed animals, or animals raised on pasture, is much more lean (and full of meaty flavor), which can result in a tougher bite. That’s why I chose an acidic marinade here. 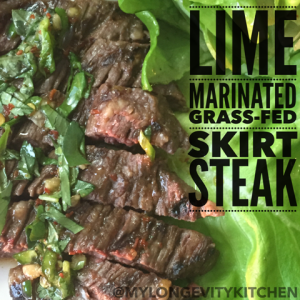 The lime juice in the marinade ensures a tender chew, and desirable flavor. “Arghhh, No Marisa! I don’t have time to marinate! I have a 9-5 and barely make it home in time to make dinner as it is!” I hear you friends. Now, hear me out. When you include acids in your marinades you are speeding up the process like crazy! You can set this aside while you prepare a salad and heat the grill, and it’s already going to be amazing. I’ve also prepared this marinade recipe with a dual function in mind. You will be using 1/3 of the marinade for exactly that, and the other 2/3 to make a delicious sauce and dressing. When I made this dish I made the marinade before bed. Then about 2 hours before dinner I put the steak in the marinade (that time worked for me, but you can marinade 30 minutes before dinner too). See the recipe below for more pointers and variations! About this steak. I am lucky enough to have purchased this grass-fed skirt steak from a local rancher. Lucky for many reasons, but mainly because I know where my food comes from, I am supporting hard-working, honest farmers in my community, I know this animal lived a healthy life eating the food it was meant to be eating (the latter is not as much about my compassion for animals as it is about the fact that a healthy animal yields healthy meat). That being said, I did not have the opportunity to choose my steak out of a lineup at the butcher counter, and inspect it for its size and accurate trimming. My steak was a little small, and thin on one end. I also had to do a little trimming myself just to remove the thick layer of excess fat. This article on Serious Eats shows you how and tells you why. A quick marinade of lime and fish sauce tenderizes your grass-fed steak, and gets an impressive dinner on the table with ease. 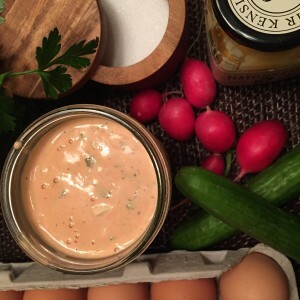 This dual-purpose marinade serves as a delicious plating sauce and salad dressing. 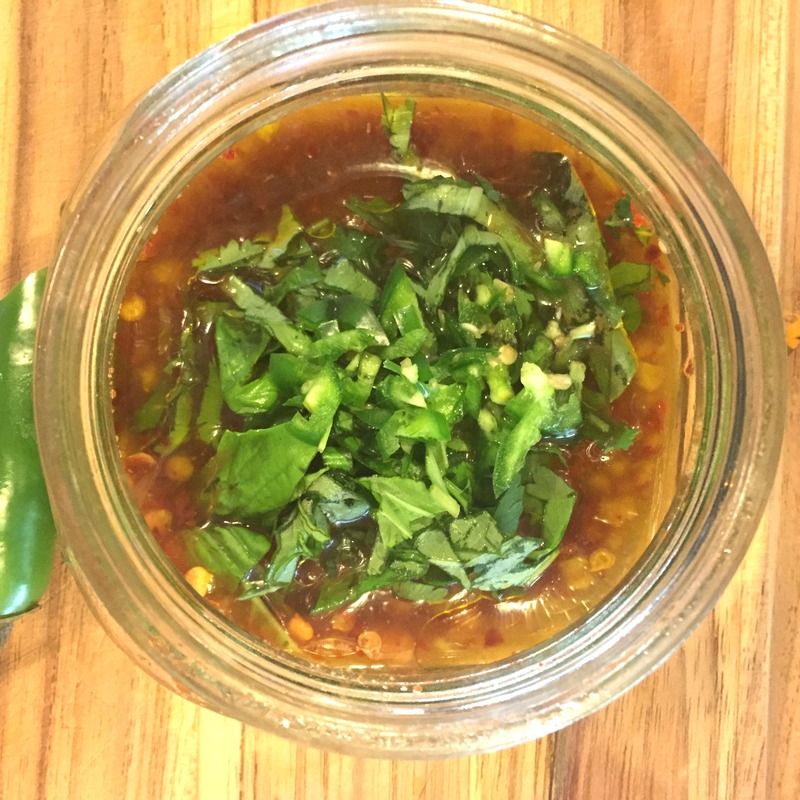 In a small glass jar with a lid, mix together the water and coconut sugar, garlic, lime juice, fish sauce, and crushed pepper. Shake it all up and set aside. Pat the steaks dry with paper towels and place them in a gallon-size Ziploc bag. Marinate your steak at room temperature 30 minutes before dinner by adding 3 Tablespoons of the marinade to the Ziploc bag with steak. Swish it all around to coat the steak. IMPORTANT NOTE: Max marinade time for this recipe is 2 hours refrigerated. You MUST refrigerate the steak while marinating if you go longer than 30 minutes because this is a salty/acidic marinade. Marinating any longer will ruin the taste and texture completely. Remove the steak from the fridge 15-30 minutes before cooking so it can come to room temperature. Once ready to cook, heat a grill pan, cast iron pan, or heavy bottomed pan; and coat the grill with a high-heat fat like ghee, avocado oil, palm oil, or palm shortening. You want the grill pan nice and hot before cooking. Remove the steak from the bag and shake off the excess marinade. Grill the steak 3 minutes on the first side and sprinkle with sea salt while grilling. Flip the steak and cook 2 more minutes on the other side, sprinkle with sea salt. Place the steak on a plate to rest for 3 minutes before plating. Meanwhile, add the herbs, olive oil, and diced chili to the jar with the leftover dressing. Shake it up. Spoon the dressing over each steak as you serve. You can use the lettuce to make a wrap or you may toss the greens with the leftover dressing. Make the marinade the night before, and add to the steak when you get home from work. Then by the time you’re ready to grill it will be ready to go! 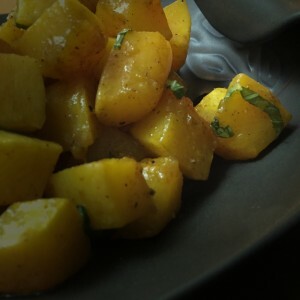 I suggest serving this for dinner with basmati rice, and my six-spice butternut squash. Makes a great lunch all by itself with the salad or lettuce wraps. This recipe works with flank steak too. Flank needs longer cooking time by 2-4 minutes extra per side. I think hot sauces, and salsas are my favorite foods ever. And doesn’t just the word “Pesto” make your mouth water? Don’t you even think for a minute that this pesto has to be paired with something bland because of its mighty super-tasty powers! This pesto is to Italian food like sriracha is to Thai food. Don’t believe me? Make it yourself and slap it on everything you eat. Ahh-mazing. 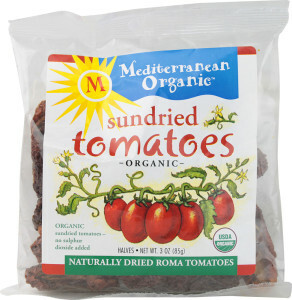 Before you dive in and start this recipe, I must introduce you to my favorite sun-dried tomatoes. These bagged tomatoes are much different than the oil-packed style you’re used to seeing (and eating). 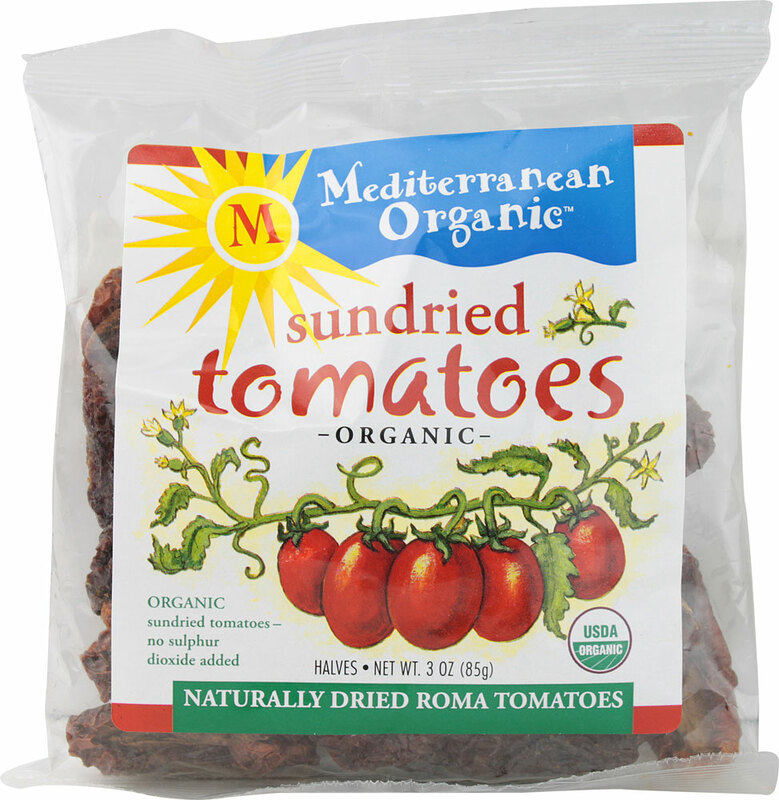 Try these, and you’ll be amazed how delicate the flavors are while still bringing you what you would expect of a delicious sun-dried tomato. Have fun with the recipe and try using all sorts of peppers! Especially if you can get your hands on organic fresh peppers. Add some olives, nuts, and even Parmesan! Invite me over for dinner would you? 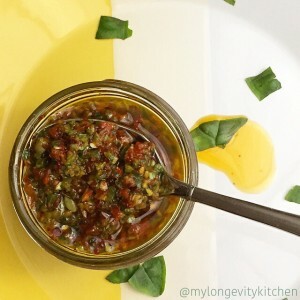 A mouth-watering combination of fiery fresh jalapeno peppers, Italian basil, garlic, sun-dried tomatoes, capers, Aleppo pepper, and of course Extra Virgin Olive Oil. This 5 minute pesto will add heat and dimension to your favorite foods like you could never imagine. Add the tomatoes, fresh hot peppers, and garlic to the food processor and pulse several times to finely chop and incorporate each ingredient. Now add the Basil, Aleppo Pepper, and Capers, along with a generous sprinkle of salt and pepper. Pulse several times to crush all the ingredients together. 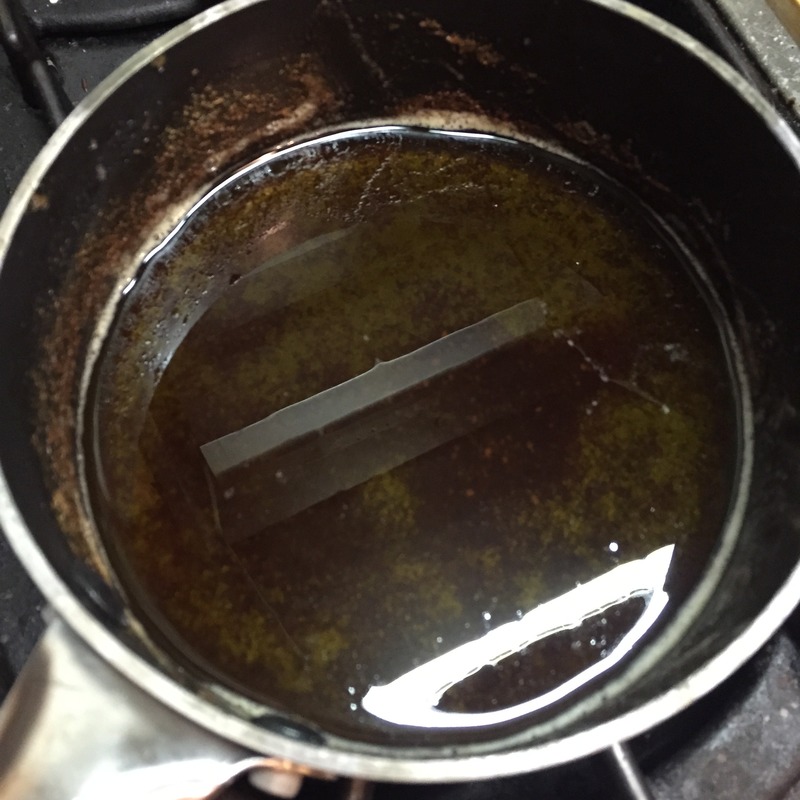 Add a splash of oil if the mixture is too thick to process. Taste the pesto for salt. Scoop the pesto into glass jars, and cover the pesto with oil. Stir the jars carefully to saturate the pesto with oil, and refrigerate. Variations: Try olives instead of the tomatoes or capers. Try any type of fresh peppers. Try Adding Parmesan and pine nuts. 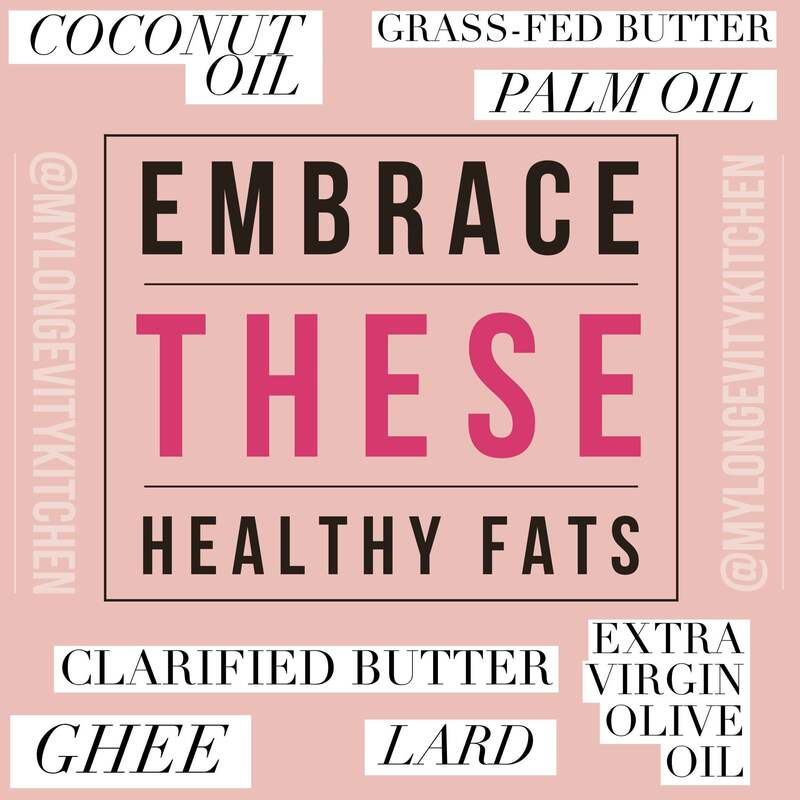 If you haven’t heard of this popular cooking fat that is making a comeback right now, I would be very surprised! GHEE is everywhere! But WHY? 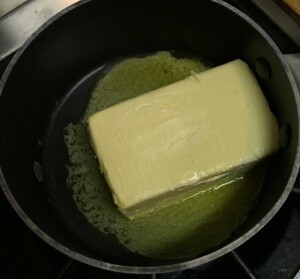 This ancient form of clarified butter has been used as a healthy cooking fat for longer than documentation can confirm. 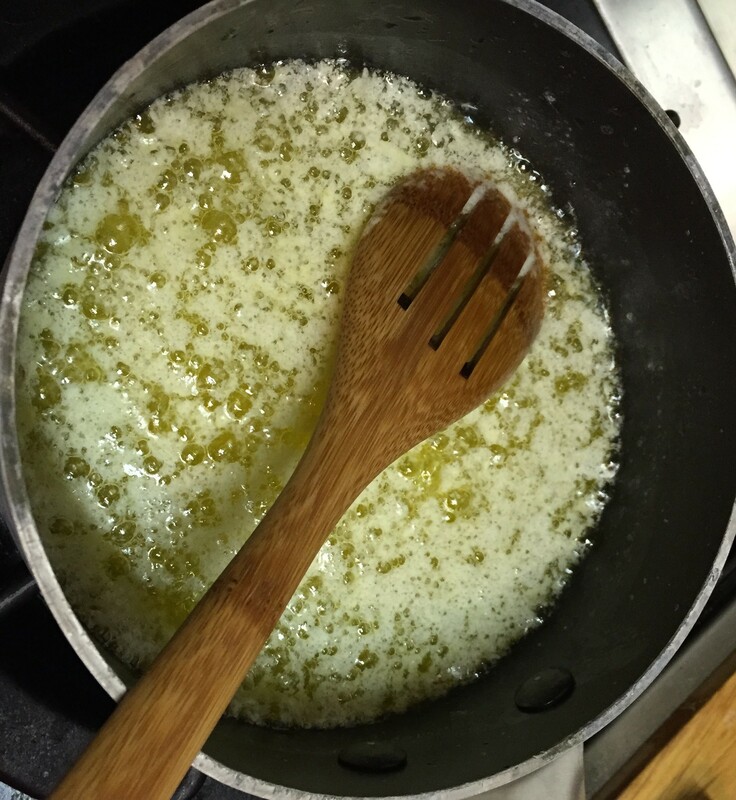 Ghee is essentially strained brown butter, resulting in “butter oil“. 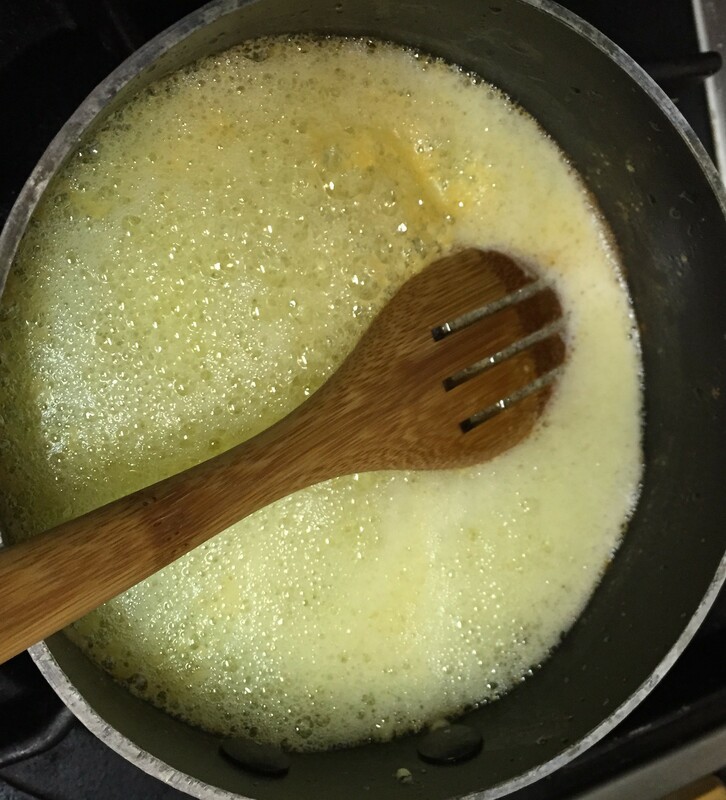 When the butter is slowly warmed on the stove, the water evaporates, milk solids and proteins begin to separate from the fats, and you can easily separate these fats to retrieve the clarified butter (clarified butter is the star ingredient in the mother sauce, known as Hollandaise). Now, cook that butter a little longer, and browning begins to occur. 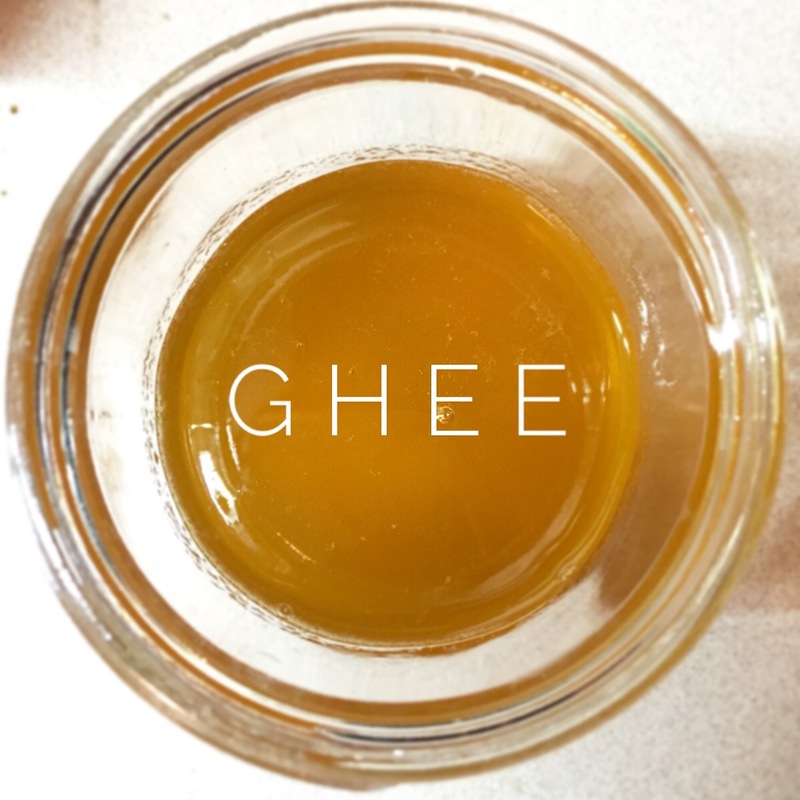 Soon, you develop a nutty depth and complexity that can only be found in Ghee. 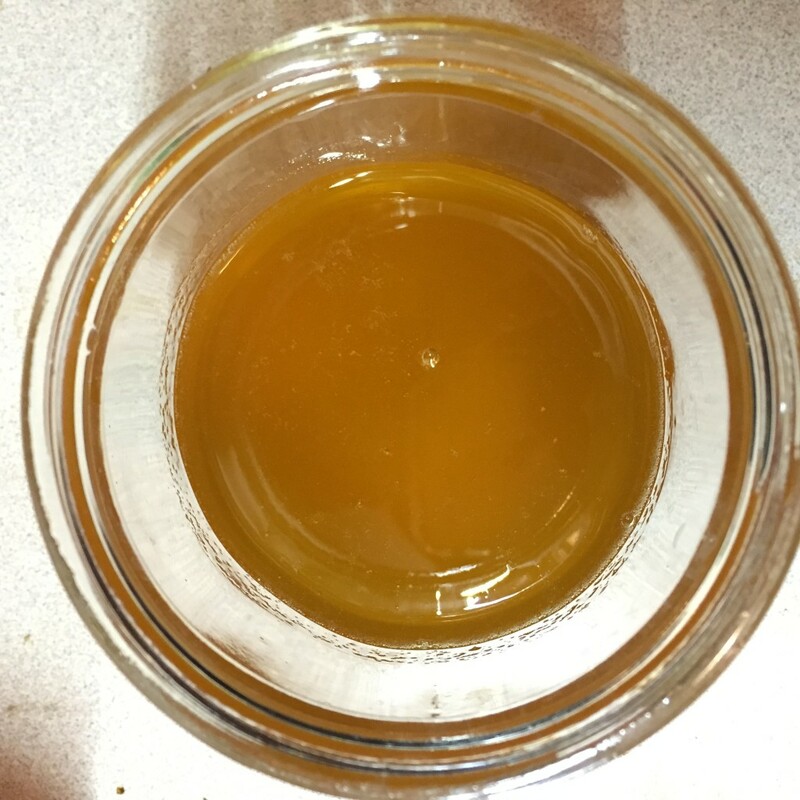 Both Ghee and Clarified Butter have incredible health benefits. As long as the butter is from a healthy source (such as cows raised on pastures, fed grass, free of growth hormones and antibiotics, fed non-gmo supplemental feed), the resulting “butter oil” is high in conjugated linoleic acid (CLA combats cancer and cardiovascular disease, and inflammation), Vitamin A, Vitamin K2, beta carotene (you can tell this by comparing the golden color of grass-fed butter next to the pale white color of conventional butter), and has a far better Omega-3 fatty acid ratio than conventional butter. 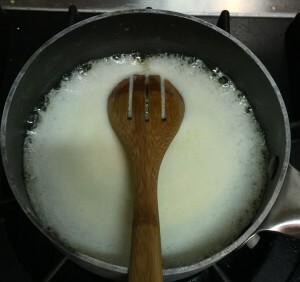 You should also note that most of the milk solids and proteins (lactose and casein) are removed during the process of making ghee and clarified butter. This means nearly everyone but the most sensitive individuals can enjoy the benefits of ghee in their diet. 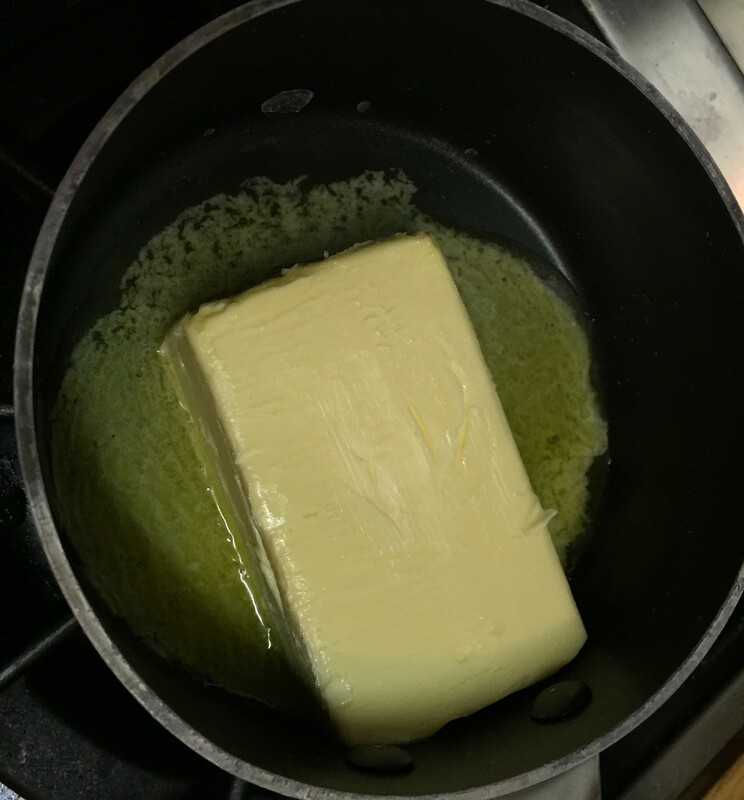 Did I mention that ghee and clarified butter have a much higher smoke point than regular butter? 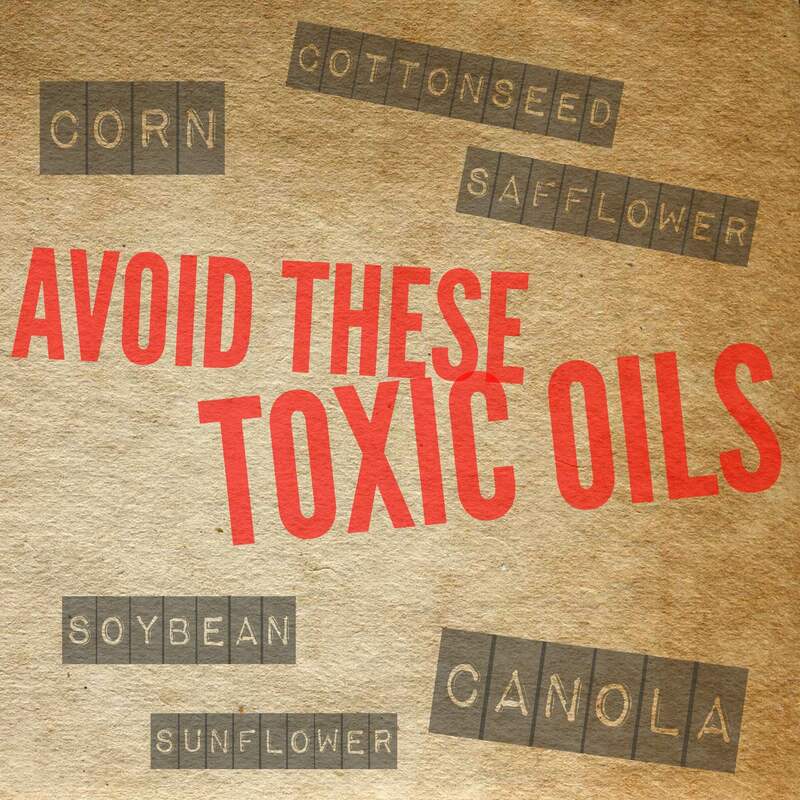 You can pan fry and roast foods in ghee without causing damaging free radicals! Sure you can buy grass-fed organic ghee at the supermarkets now, but they are more than $1.00 per ounce! You can make your own ghee for less than half that price. Try out this step by step tutorial, and let me know how it goes! About a minute after the butter is all melted, the top layer will become fluffy foam. 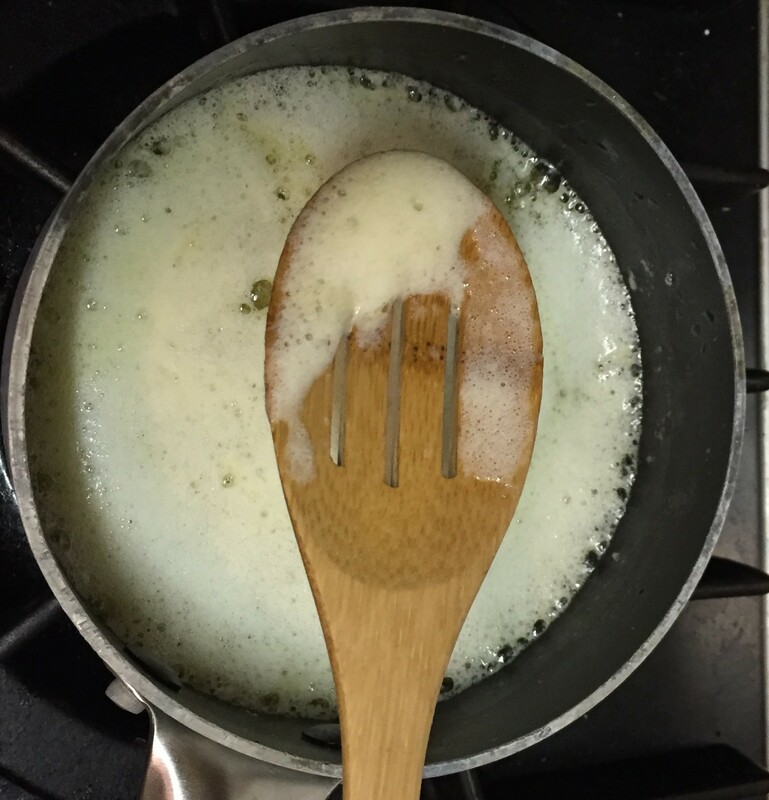 To encourage the water to evaporate, and allow air to escape, you can rest a slotted wooden spoon upside-down like the second photo below. Or gently move the foam around, by skimming the top, to let air escape. About 2 minutes later, you will notice the foam is no longer fluffy, and starts to bubble more and separate. 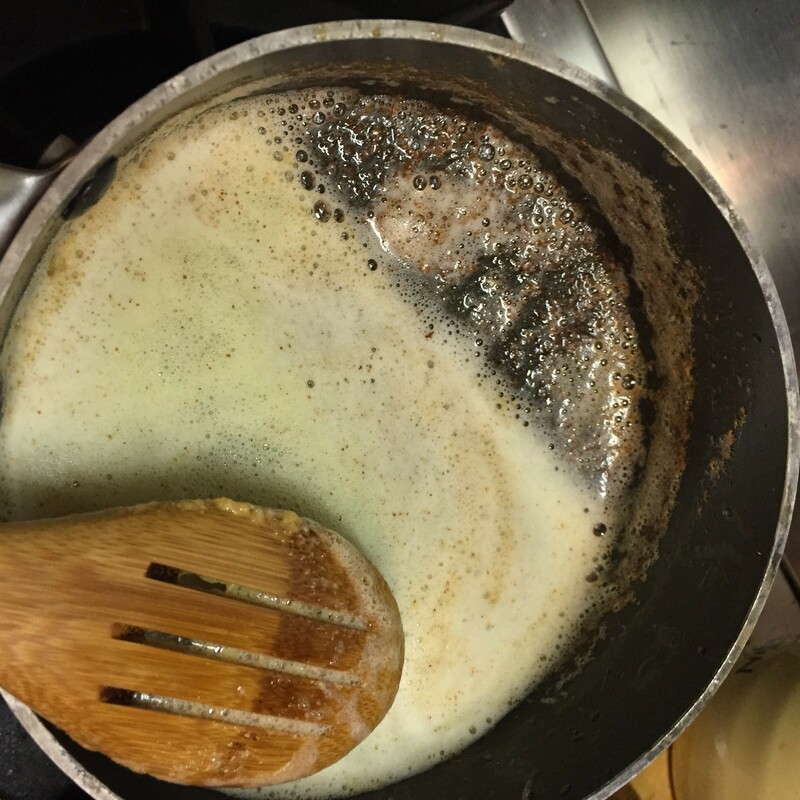 Continue cooking, and if you tilt the pan, you’ll notice almost all of the white milky solids will have fallen to the bottom of the pan, while the top is still bubbling and foaming again. In these next few minutes (around 9-12 minutes into the process) the milk solids will be browning at the bottom of the pan. Tilt the pan to check on the browning. Keep cooking until it is dark brown, and remove the pan from the heat when it looks like it might begin to burn. 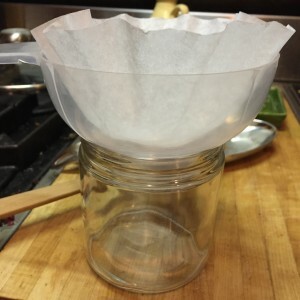 Pour the ghee through cheesecloth or a coffee filter resting on a funnel. Congratulations! 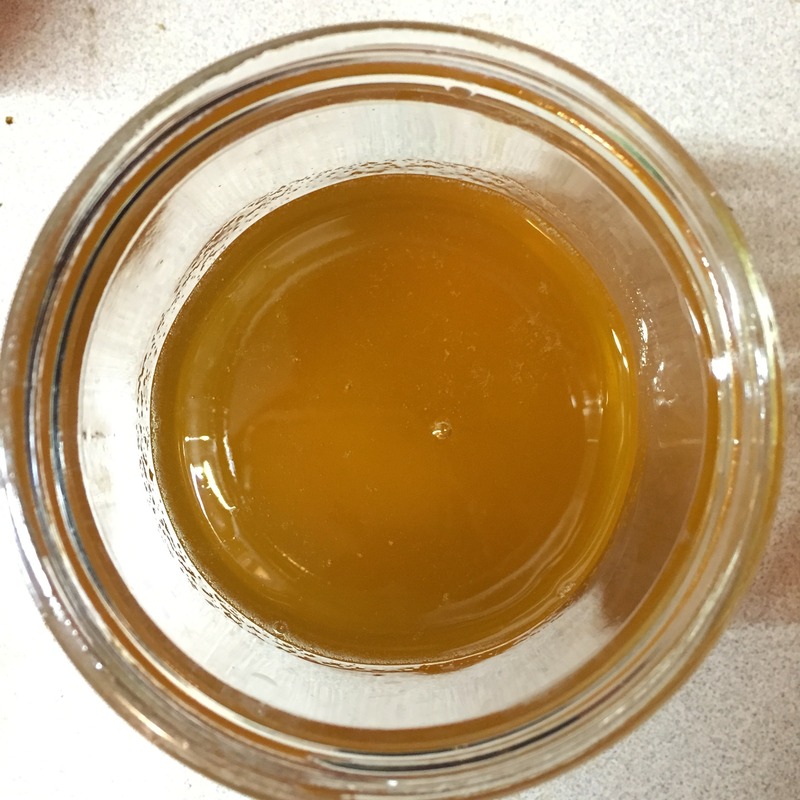 You made your own GHEE! Ghee is safe kept in an airtight container at room temperature for up to a month, or you may refrigerate it to prevent any possibility of spoiling. Make a bunch so you can stock up! You can freeze ghee too. 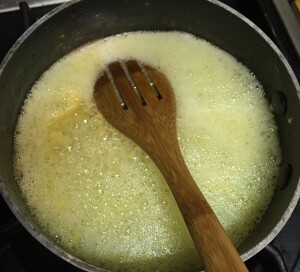 *To make Clarified Butter (which has a cleaner, more neutral taste, and shorter processing time), carefully skim all of the foam off the top in Step 2. Once you have cleared off as much foam as possible, without disturbing any milk solids that settled to the bottom, you may ladle or pour out the remaining fat (carefully avoiding the milk solids on the bottom). 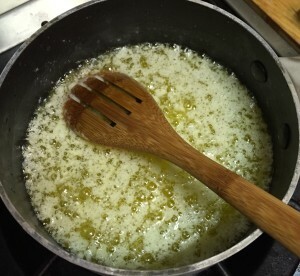 Clarified Butter may not last at room temperature for more than a couple of weeks since it is not strained like ghee is. This paleo cookie dough is a major hit! I made it at least 3 times in two months. Maybe more. 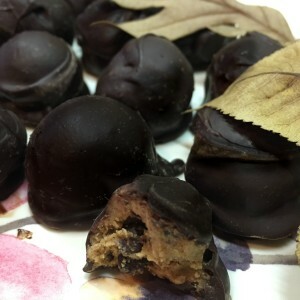 I rolled it into balls and dipped them in dark chocolate for Thanksgiving too! It’s super slammin’ just out of the jar (with a spoon in da mouth), but the chocolate covered balls bring it to a whole ‘nother level. Dare to walk passed your fridge without grabbing a nugget every time. The best part is, they are even more delicious when they’re cold! Before I tell you what’s in this creamy nutty magical mixture, I must tell you about a fairly recent addition to my longevity pantry. Since the Summer of 2014, I have been hooked on figuring out ways to get more Maca into my cooking. 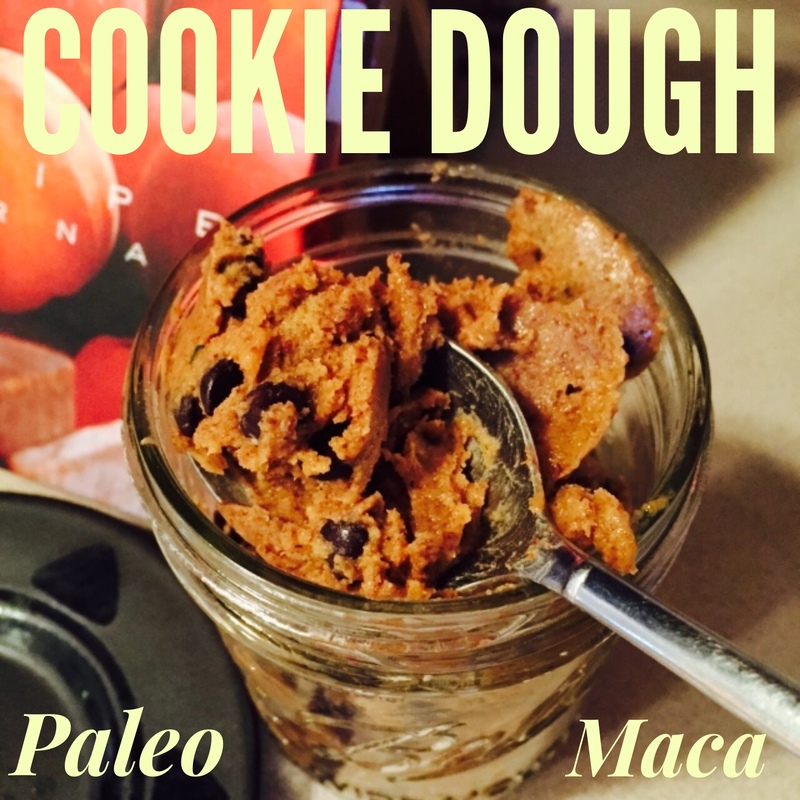 THIS cookie dough was the perfect vessel I tell you! Let’s give Maca the moment it deserves and discuss what it is and why I want it in my food. I found the original recipe by “Girl Gone Country” on Pinterest, and I was inspired to come up with my own variation including maca. I also altered the original recipe by adding some alternative sweeteners. Why? First, to lower the glycemic index with some stevia, and then using the coconut sugar to bring out the cookie-like flavor I was seeking. Lastly, the combination of them all was sure to satisfy a certain husband’s sweet tooth. 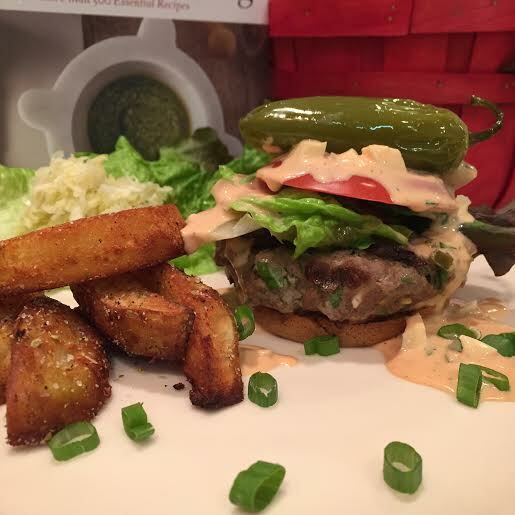 Check out Girl Gone Country’s original recipe here and play around with ingredients in your own way! Tag me @mylongevitykitchen on social media and share your ideas in the comments below. Grab a spoon and dig into a jar full of nutty, gooey, chocolatey, goodness! 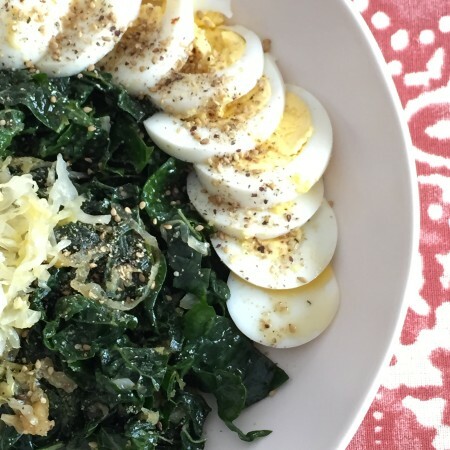 You can rest assured you're eating wholesome paleo superfood ingredients with this recipe. In a quart-size sauce pan, brown the butter on medium heat. 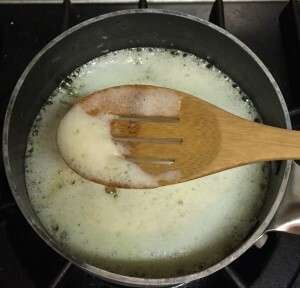 To brown the butter, you want to continue cooking the melted butter until it starts smelling "nutty" and sticking slightly to the bottom when you try to stir with a spatula. If you start to see black bits, don't panic. You can strain these out, and the browned butter is still delicious! Once the butter is slightly browned and smelling nutty, remove the pan from the heat, and add in the almond butter. 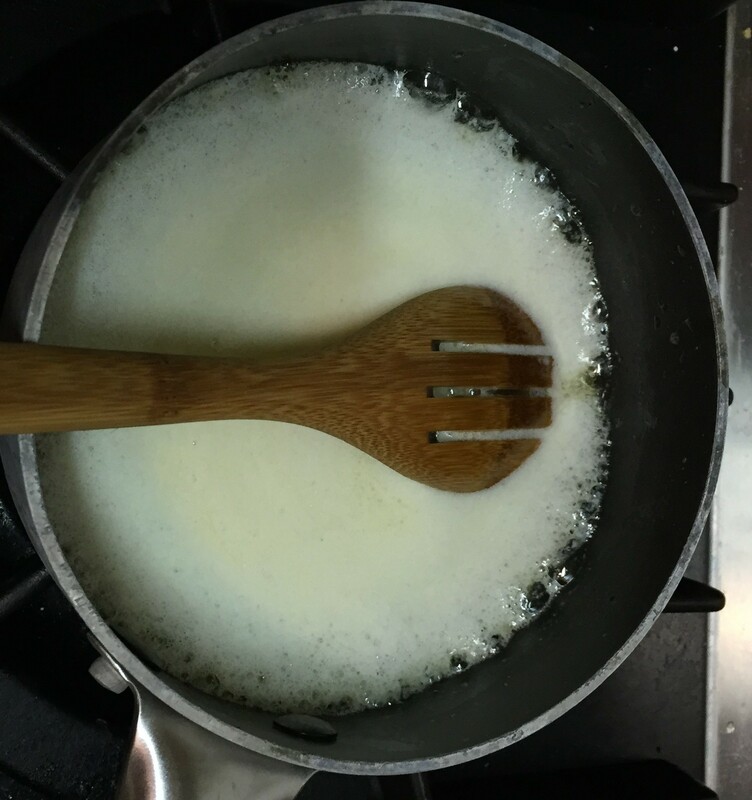 Whisk or stir with spatula to create a smooth mixture. In a separate bowl, mix together the dry ingredients including maca, coconut flour, cinnamon, and salt. Sift the dry ingredients into the almond butter mixture, and mix until smooth. 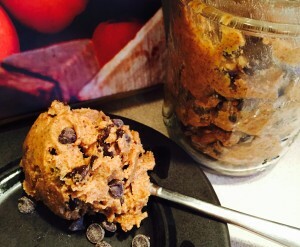 Transfer your warm cookie dough to a bowl, cover loosely, and refrigerate for 45 minutes. Set a timer so you don't forget. If the mixture gets too hard, you’ll find it difficult to incorporate the chocolate chips. Stir in your chocolate chips and refrigerate for 30 more minutes and you're done! Enjoy by the spoonful. This cookie dough is best eaten cold out of the fridge. It does not retain it's flavor if kept in the freezer for more than a few days. Variation: For a party-ready application, you may freeze the mixture for 20 minutes, shape into balls, re-freeze, and then dip into melted chocolate! Refrigerate until you're ready to eat them.